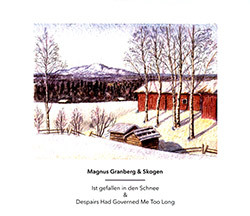 Ist gefallen in den Schnee: A piece by Swedish composer-pianist Magnus Granberg, performed with Angharad Davies, Anna Lindal, Leo Svensson Sander, John Eriksson, Erik Carlsson, Henrik Olsson, Petter Wastberg and Toshimaru Nakamura; Despairs: A beautiful extended composition exquisitely played by an ensemble of fine musicians. 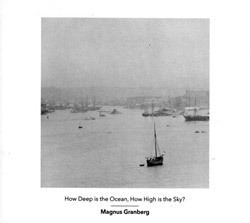 Granberg, Magnus : How Deep is the Ocean, How High is the Sky? 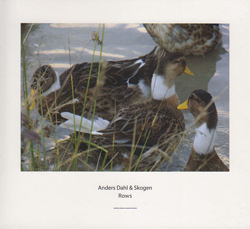 Swedish composer Magnus Granberg (Skogen) places baroque instruments alongside prepared piano, objects and electronics in an exquisite 60-minute piece performed with an excellent set of performers including Cyril Bondi, d'incise, Eric Ruffing, Christoph Schiller, &c.
Sweden's Skogen returns with a beautiful work for chamber ensemble with Magnus Granberg, Angharad Davies, Toshimaru Nakamura, Ko Ishikawa, Anna Lindal, Henrik Olsson, Petter wastberg and Erik Carlsson, interpreting a piece by Anders Dahl using a 12 tone system.